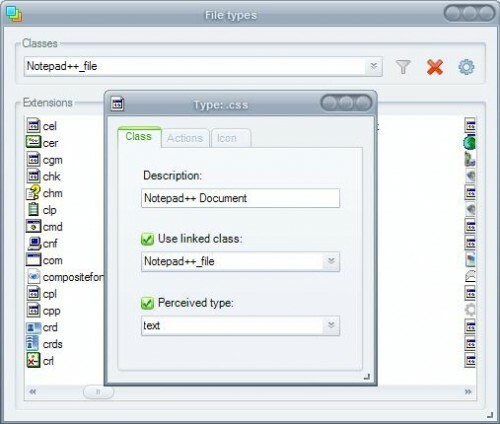 Types on the other hand is a lightweight portable Open-Source software that runs on Windows XP and Windows Vista that makes it a tad easier to change file associations in both operating systems. It comes with a window that can actually be changed in size which means that it is possible to display virtually all file extensions on the screen at the same time. The default application can be changed easily. Other options include changing the icon of the file type and deleting obsolete ones from the system. Update: Development of Types has continued in past years bringing Type's version to 1.9.4 at the time of writing. The version history reveals information about the things that have been changed by the software's developer. The majority of changes are related to bugs, but the software's compatibility with Windows Vista and Windows 7 has been improved as well. Third parties have localized the software into other languages. These language files can now be downloaded from the Types website as well. Users who want to change the program interface language need to download the language file of their choice and put it into the Types directory. They then need to press F1 with Types open to select that new language file. Update 2: The most recent version of Types is also compatible with the Windows 8 operating system.